The touristic agency Radulj Tours was founded on Mljet in 1995. It was one of the pioneers of the touristic activities of organising recreational and adventurous tourism on the island of Mljet. If you want to feel the rush of adrenaline, and enjoy every authentic contact with nature, the sea, the sun, and historical landmarks, then the island of Mljet is the right destination for you. We offer a wide range of services for those who love active holidays, from renting canoes, kayaks, and mountain, trekking and electric bikes, to guided recreative hiking. If you want to explore the island of Mljet on your own, you can rent a car or moped, and enjoy the beautiful nature and small picturesque villages of the island carefree. For all those who want to go on an arranged tour to explore the beauties of the island of Mljet, we organise day and half-day trips to the island’s cultural and historical landmarks. Our kind and professional staff looks forward to seeing you at our selling spots. We will be pleased to help you fulfill your wishes. 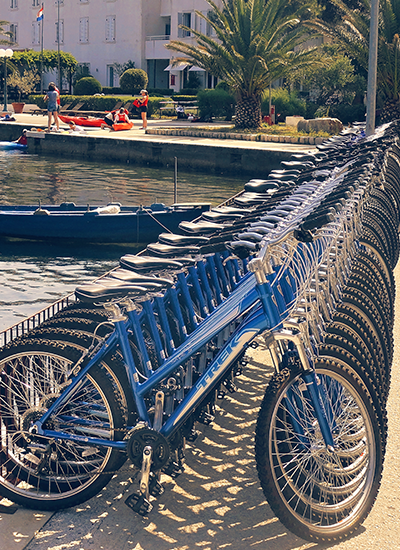 As the use of vehicles is restricted in the National Park Mljet, cycling or kayaking will be a perfect way for every nature lover to exhibit the beauties of the national park whose numerous visitors are excited by the colours and scents of its untouched nature and crystal blue sea.